A video from Kerala going viral on social media shows a large group of people dancing on the road with hardly any space left for vehicles to pass. Men can be seen grooving to the sound of loudspeakers with people watching them from housetops. 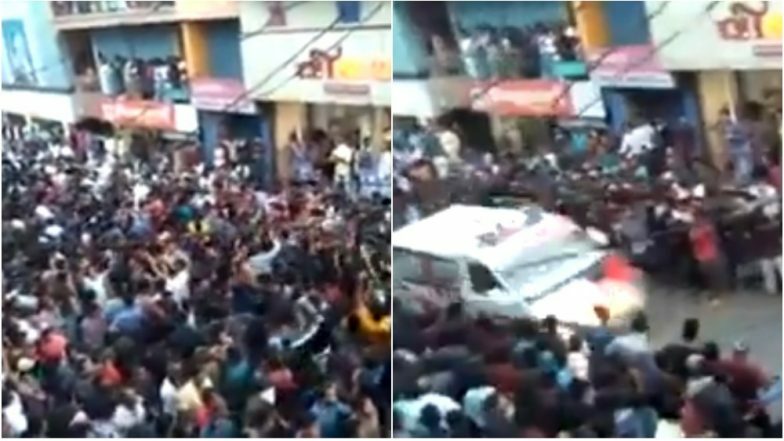 While the celebration goes in full swing, an ambulance arrives at one end of the road, trying to make way through the crowded place. However, as soon as the crowd sees the ambulance, they swiftly make way for it, with people parting into two sides. Reportedly, the video was captured during Mannarkkad Pooram in Palakkad, one of the oldest temple festivals in Kerala. People can be seen ushering each other to move and make a road for the vehicle to pass. The large group of people suddenly stop dancing letting it go first. The clip has been going viral on social media since quite some time garnering praises. The gesture of the people was termed as something people everywhere should follow. While we often hear of incidents where people couldn't be taken to hospital on time due to heavy road traffic, this video comes as a breather. Delhi: Man Gets New Life as Green Corridor Cover 3.6-km in 3.28 Minutes For Transporting Live Heart. The festival falls in the month of March every year which also sees the presence of tribal people from Attapadi who come to offer prayers. The mood of temple festivals in Kerala are marked by percussion instruments and cultural events. While melam continues to be a tradition at every temple festivals in the state, new age music including Bollywood songs being played by DJs have become part of the celebrations.